every zip used in a straight cut frame bag has been structurally enhanced giving it more rigidity which decreases pulling forces on the zip head. therefore, making them more user friendly and increasing the lifespan of the zip. LOCATED ON THE TOP beside the headtube on the edge of the frame bag. THE PORT IS THE FULL WIDTH OF THE FRAME BAG ALLOWING FOR MULTIPLE HOSES/CABLES TO FIT. 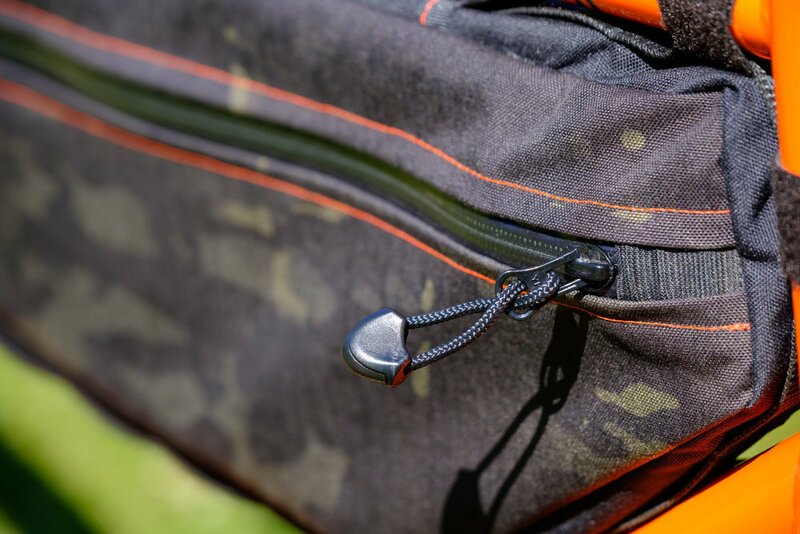 This feature is perfect for when using a water bladder inside the frame bag. ONE WRAP VELCRO® IS INCREDIBLY STRONG AND ALONG SIDE the MULTIple POSITION WEBBING SYSTEM, THIs allows for a quick and easy install of your frame bag. You will be supplied with a uncut roll of velcro® so that you can measure each strap to get the best fit for each point of attachment. USING HOOK AND LOOP VELCRO® EACH STRAP WILL BE SEWN INTO YOUR BAGS SEEMS. THESE STRAPS WILL BE POSITIONED IN CORNERS AND MIDDLE OF YOUR FRAME BAG SIDES, THIS ENSURES BAG HAS EVEN WEIGHT DISRUPTION AND HOLDS ITS SHAPE TO YOUR FRAME. USING Multiple webbing tabs along THE edge of THE bag WITH A network of cord to secure to YOUR frame. the Cord IS secured at the end with a cord lock to give an adjustable but secure fitting. 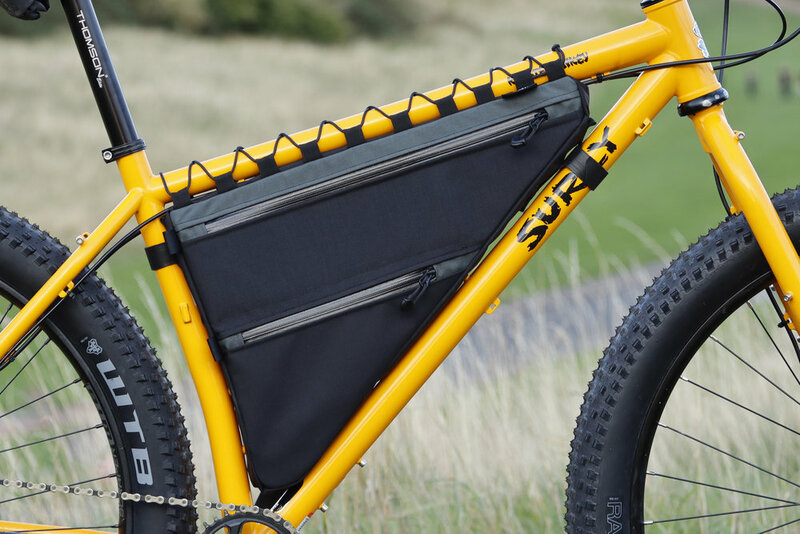 THE SLIM POCKET IS LOCATED ON THE NON-DRIVE SIDE OF THE FRAME BAG. THIS POCKET IS GREAT FOR STORING SMALL ITEMS THAT ARE frequently used SUCH AS PHONE or your titanium spork. The horizontal divider has a zipper entry FOR EACH COMPARTMENT POSITIONED on the drive-side. There is a removable velcro® divider that creates a horizontal partition when in place. When opened up, you have full access to the entire bag from EACH zipper entry. This divider comes reinforced with two velcro® straps that lock on themselves. The REINFORCEMENT straps secure the sides of the bag together that allows the top compartment to be weight baring. The INTERNAL SEGMENTS give better internal organisation TO your FRAME BAG. The divider SECURES THE SIDES TO PREVENT BULGING BUT can be SEPARATED if you require FULL VOLUME FOR LARGER ITEMS. STANDARD WIDTH OF A FRAME BAG IS 60MM. IF YOU WISH YOUR BAG TO BE MORE AERODYNAMIC OR NEED MORE ROOM FOR AN EXTRA BEER THEN PLEASE ADD THIS INFORMATION IN YOUR EMAIL.